Until The Last Star Fades is the newest release from Canadian author Jacquelyn Middleton. If you've read her previous two books, London Belongs to Me and London, Can You Wait?, her new novel takes place in the same world with a few of the same characters popping by; however, it can be read as a standalone. That's what I did! In this book, we meet Riley and Ben. NYW student Riley is looking for a distraction from some heavy challenges in her life. Here on a temporary visa, British Ben is looking for maximum fun with minimum commitment. They seem like a perfect match. 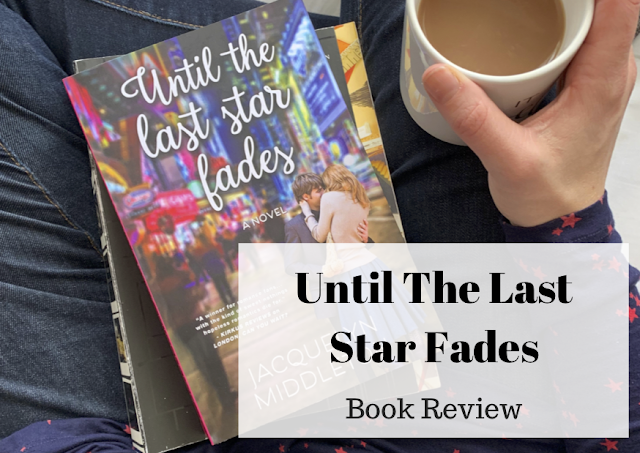 However, Until The Last Star Fades is so much more than a simple love story. It's difficult to review this book without giving anything away, because there are a lot of layers to this novel, but I want you to know that if you are in the mood for a book that is fun but has substance, you will not be disappointed. This book tackles both mental and physical health in an emotional and touching way. Life is messy, and it's nice to read a romance that feels real. Even though it's not easy, I like to believe that it's okay to feel hope and fear at the same time. I could tell that Riley and Ben were struggling with that too. What made me tear up the most when reading this book; however, is that Until The Last Star Fades is, unexpectedly, also a love letter to mothers everywhere. Because moms really are the best. I hope you pick up Ben and Riley's story, and I sincerely can't wait to read more Jacquelyn Middleton books in the future! PS - One thing that Riley and Ben love to do is send each other songs. To bring Until The Last Star Fades to life, you can listen to the 4 Riles/ 4 Benjamin playlists from the book directly on Spotify. Check out the link here on Jacquelyn Middleton's webpage to listen. Disclaimer - I received a complementary copy of this book courtesy of the author. All thoughts and opinions are entirely my own.